Director of the multi-award-winning documentary “Darius Goes West,” which chronicles the epic cross-country road trip he and 10 others took with Darius Weems, a friend stricken with fatal Duchenne Muscular Dystrophy, Logan Smalley is a change agent for a new generation. He and Darius prove that idealism and creativity can result in tangible progress. Part revolution, part revelation, this film proves to people of all ages how life, even when imperfect, is always worth the ride. In this multi-award-winning documentary, fifteen-year-old Darius Weems and eleven of his best friends set off across America with the ultimate goal of getting his wheelchair customized on MTV’s Pimp My Ride. The result is a rarely seen testament to the explosive idealism of today’s youth, as well as a vivid portrayal of adventure, of brotherhood, and of the character and strength it takes to shed light on an uncertain future. Not only does Darius Weems bravely face his own inevitable fate with Duchenne Muscular Dystrophy (DMD), but through his unflinching humor and his extraordinary laugh, he sparks a revolution in the lives of everyone who crosses–and then shares–his courageous path. Darius Goes West One Year. One Million DVDs. The first treatment for Duchenne muscular dystrophy has been approved by the FDA…and you helped! 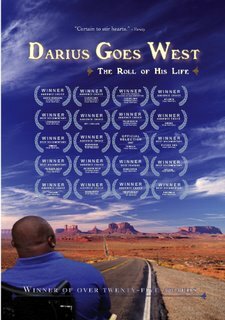 Darius Goes West is on Netflix! For more information about Logan Smalley and scheduling, contact Verbatim.